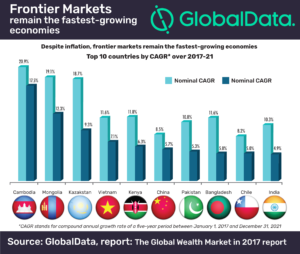 The value of liquid assets held by the global population will exceed $100tn by the end of 2017, with frontier and emerging economies leading the way in terms of future growth according to GlobalData, a leading data and analytics company. The company’s latest report, The Global Wealth Market in 2017 which analyzes the current dynamics of 71 wealth markets, estimates that the global wealth market stood at just below $100tn as of December 2016, but will surpass this mark by the end of 2017. However, the pace of growth is forecast to slow down, recording a compound annual growth rate (CAGR) of just above 5% over 2017–21, down from 7% over the previous five-year period. With giants like China and India, Asia Pacific will be the best-performing region with growth of over 8%, contrasting with a slow performance in Europe. Asia Pacific frontier markets are forecast to outperform emerging and mature markets. Countries such as Mongolia and Kazakhstan lead the rankings in terms of forecast CAGR for 2017–21, both in nominal and real terms. However GlobalData also forecasts that inflation will continue to erode a large portion of frontier markets’ fortunes. On the other hand, Asia Pacific still hosts most of the 2016 success stories. Despite being small in size, the populations of Singapore and Hong Kong remain affluent and enjoy an even distribution of wealth. Most individuals in these two markets are richer than in other developed economies. By 2021 the average Hong Kong citizen will hold more assets than an individual in Switzerland. Nonetheless, Asia Pacific is known to be a competitive market. According to GlobalData’s 2016 and 2017 Global Wealth Managers Surveys, most clients in this region already work with two or more wealth managers. Information based on GlobalData’s report: The Global Wealth Market in 2017.